Supported by Jools Holland, and run by charity Music for All, the 2019 Learn to Play Day will take place this coming weekend and will see music shops, teachers, venues and schools throughout the county partner with leading musical instrument makers to offer thousands of free music lessons. "While we all may have different tastes and preferred genres, there is no doubt that music is something that is universally loved around the world. "Our Learn to Play Day events are all about spreading the joy of playing a musical instrument and inspiring those of all ages to take up something that will not only have health benefits for the future, but that also brings so many people together." Held in partnership with the Musicians' Union, the 'Take It Away' scheme and Making Music, the Learn to Play Day initiative has been growing in popularity with a record 10,000 free lessons held during last year's event. 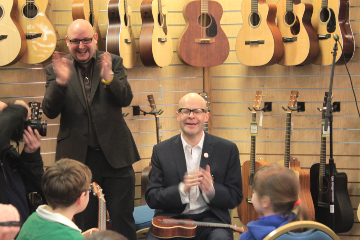 "It's a pleasure to be able to share the joy of music, and this special day allows thousands to get involved as venues all over the country offer music lessons for free."